Can you use exterior paint indoors? The real question is – why would you want to? Okay – so seriously – can you use exterior paint indoors? Yes, technically, both exterior and interior paints can be used both indoors and outdoors. However, each variety has been formulated to perform best in its own designated setting and environment. When you swap them over, it’s very much a case of adaptability rather than a seamless switch. To put it simply, imagine putting on your biggest, most-padded coat, and sitting inside by the fire all night. It is certainly possible, but not entirely advisable. Your coat is meant for the outdoors, to keep you warm when walking around outside in the cold. Can You Use Exterior Paint Indoors? We Wouldn’t! Can you use exterior paint indoors? Please don’t! Paint substances are labelled as exterior and interior for a reason. Although it is possible to use exterior paint indoors, we advise against it due to the difference in mildewcides. They are not designed for interior use, and may cause adverse respiratory problems in some individuals. Exterior paints also often contain high volumes of acrylic substances, which are known to cause lingering odours. The whole chemical and cosmetic make-up of exterior paint also differs too. These paints are created to withstand the great outdoors, and all of Britain’s wonderful weather conditions-from heavy rain and sleet, to frustratingly frosty conditions. A premium latex exterior paint contains flexible acrylic resins, which will contract and expand along with your home’s exterior with fluctuating temperatures and weather types. Exterior paints are a lot better than interior paints when it comes to water resistance too. They also contain ultraviolet-blocking additives. Not sure what these are? They prevent premature breakdown caused by daily abuse from direct hot sunlight. It makes sense really. Always stick with what makes sense! 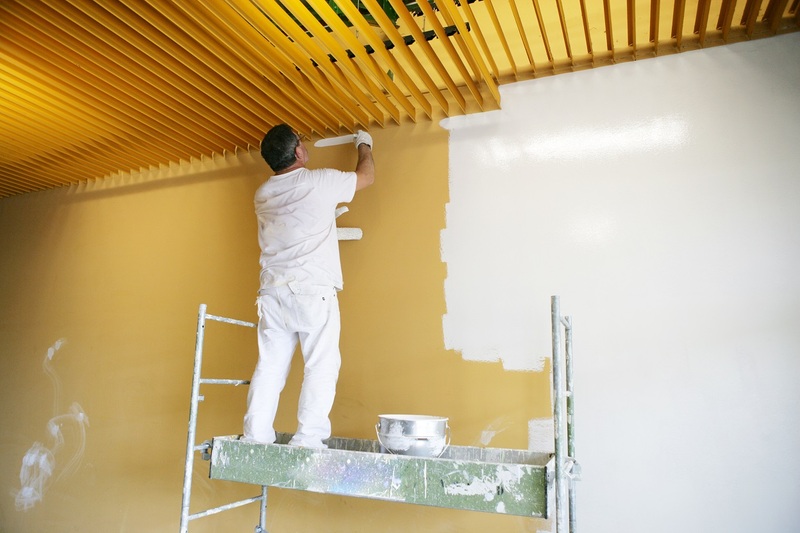 Most modern indoor paint products produce minimal odour, and little-to-no toxic emissions. The chemical fumes of exterior paint, including volatile organic compounds (VOCs), can linger in the air indefinitely. This can have some strong side effects, and cause adverse health effects for many individuals. Whilst we are on the topic of painting your exterior, it’s also important to consider the insulation qualities of the product you choose. Yes, your new lick of paint might look good, but is it helping your home in the long run or just looking flashy for now? You might not think the thermal quality of your exterior coating is important, but when you realise that 25% of internal heat is lost through your walls, you may reconsider! Homeowners need to think of ways of reducing their energy use, so that they can save money on their energy bills. When energy tariffs soar, the home budget can be overstretched, causing further cut-backs elsewhere in your lifestyle. As mentioned above, up to 25% of heat loss occurs through your home’s walls. The good news is that there is a new product on the market! One which will enable you to be house proud of your property’s appearance – and absolutely over the moon with your finances too! We are of course, talking about Home Logic Wall Coatings! This revolutionary product will improve the overall thermal efficiency of your home by reducing the amount of warm air lost through the walls. This is certainly one way of significantly reducing your energy spend over time! Furthermore, the addition of external wall insulation helps protect against moisture and dirt build-up. Here at Home Logic, we provide our customers with insulated brickwork, applying an invisible barrier that protects against water absorption up to 17mm deep. Using our high-spec equipment and machinery, the application process is quick and effective. The end result is external wall insulation that reduces the absorption of water by more than 95%. This also keeps your walls free from the effects of weathering. You’re even protected against corrosion from pollutants, such as salty sea air. Cracks within the stonework are filled, reducing their visual impact, whilst simultaneously improving thermal efficiency. As rain is unable to penetrate your masonry, it will carry away dirt and grime as it falls to the ground. So you don’t have to wash your walls! Ever! Cleaner walls mean less bacteria and less algae too, so extremely useful all round! Contact the Home Logic Team Today! For more information, or for independent and expert advice on how to protect your walls from inclement weather, please call our team on 0800 1700 636. Alternatively, you can send us an email at: survey@homelogic.co.uk, or simply click the button below!